With the holidays approaching Paramount has put together a kid’s holiday giveaway package. 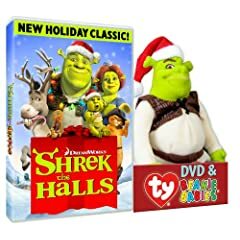 Enter the contest now to win the giveaway that includes Madagascar, Kung Fu Panda, The Furious Five and Shrek the Halls (including a Shrek plush doll). Paramount Home Entertainment (PHE) is part of Paramount Pictures Corporation (PPC), a global producer and distributor of filmed entertainment. PHE is responsible for the worldwide sales, marketing and distribution of home entertainment products on behalf of various parties including: Paramount Pictures, DreamWorks Studios, Paramount Vantage, Paramount Classics, Nickelodeon, MTV, Comedy Central, CBS, PBS and Hasbro and for providing home entertainment fulfillment services for DreamWorks Animation Home Entertainment. One lucky winner will receive this giveaway package. To enter the contest, simply tell us what you think is the best and worst part about being a Dad at Christmas. Funny answers, sentimental answers, or even insightful answers will be preferred. Send in your answers using the comment form below. Last date for entries is December 21, 2008.